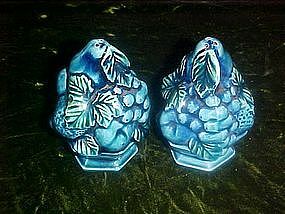 Retro fruit salt and pepper shakers with a deep turquoise blue glaze, made of ceramic. Original Inarco sticker with the number E-2871 0r (2371) printed on the bottom. Perfect condition with plastic replacement stoppers.